After some surprisingly large gains yesterday, oil markets are mixed this morning. Crude oil picked up 60 cents (0.9%), leading prices to close above $64 for the first time in almost two weeks. Today, prices are pushing higher as the market digests the EIA’s inventory numbers. 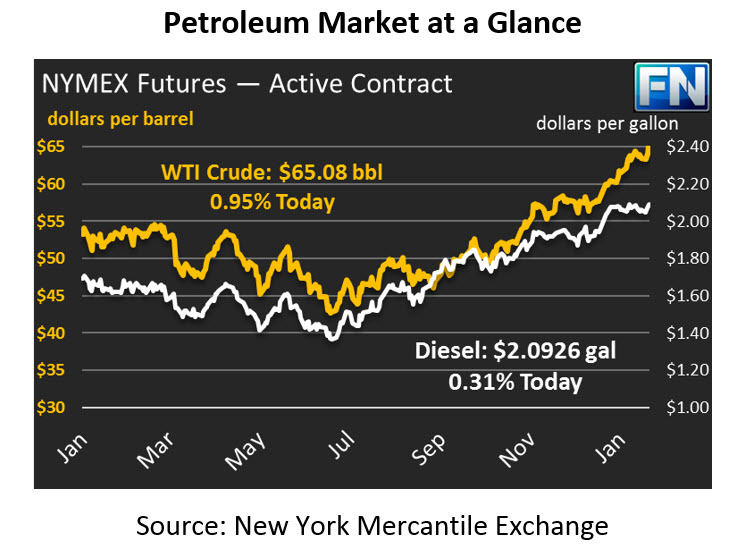 Crude prices are currently trading at $65.08, yet another three-year record, with a gain of 61 cents (1.0%). Refined fuels are mixed this morning. Both products gained 1.1% yesterday, spurred higher by the API’s note of declining refinery run rates. Today, diesel prices are currently trading at $2.0926, just .65 cents (0.3%) above yesterday’s closing price. Gasoline prices are down over half a cent, currently trading at $1.9034. The API released their weekly data yesterday afternoon, and the EIA just released their inventory statistics this morning. The API reported that crude stocks rose for the first time since November, but the EIA disagreed and showed a small draw. Seasonal builds are normal in January through March, so the continual draws this winter are quite surprising. On the fuels side, gasoline saw stocks rise in line with seasonal trends, while diesel reported very minor builds. Looking internationally, Libya re-opened a major oil field this week, which helped to temper bullish expectations. The country has seen productions slowly trend towards more stability, though surprise outages remain a possibility. Reuters reported recently that Iraqi oil exports have declined by 100 kbpd in January, countering the news from Libya and giving market bulls something to get excited about.